Let me ask you a question: If you were notorious at some point in your life and every one around you tried avoiding you virtually in every way,and later,you realized it was bad and begin to make efforts to adjust and become someone to be acceptable and yet,people still find it difficult to associate with you how would you feel? If you still put more effort to be of good behavior and they still refuse to give you a place,what would you then do? Growl and fight? Something like that am sure. This is exactly what is expected in a society that would refuse to give equal treatment to ex convicts as they would do to other citizens. Any society that discriminates a set of people end up asking for troubles,and crimes in that society. We give you an example. Some former Niger Delta militants in Nigeria were ex convicts. When they can back to society as free men,they discovered that they no longer had a place in their community and society at large. They felt rejected,dejected,and treated unequally with other people. So what they did was to join and form a group of militancy. These people became a group of terrorists to the whole country at large. At a time,both lives and properties were destroyed,and the era of kidnapping took place,vandalization of national wealth and resources took over and the likes. The only thing that could settle this problem was a dialogue with them to know their annoyance and you know what they said? They released that the unequal treatment they receive as ex convicts was unbearable to them,and that their action was the only way to expressed their anger and dissatisfaction. Did you you know what the government did? They extended an amnesty program to equip them greatly to become better persons for themselves and society. It is simple. 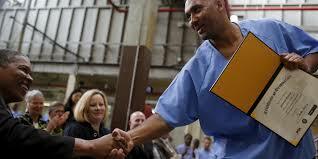 Choose to discriminate or deject ex convicts and be ready to pay the consequences so dearly, even with your own life. Many ex convicts who have not been able to find their feet in society,have killed their threats and even themselves for fear of going back to prison and rot eternally there. Treating ex convicts with partiality,and not equally with other members of the society bring back the worst of their bad persons in them. It does not make any sense discriminating or mistreating ex convicts for any reason. We have also seen that what happens when ex convicts are not treated equally in society is disaster,loss of lives and properties,and creation of more crime and crises in society!! !